First up, there are a couple of small omissions in the written instructions for Milkweed, in Chart D. Rows 64 and 66 were missing a yo, and Row 68 was missing a k6. 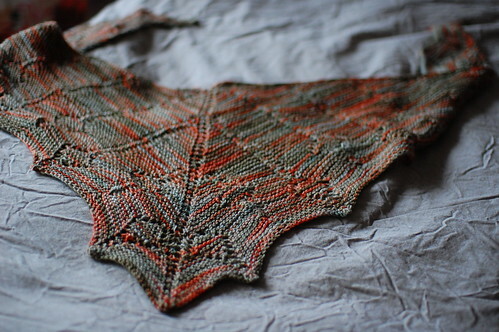 These have been corrected, and you can download another version on Ravelry called “MilkweedShawlJune18”. I tried to send out a notification from Ravelry, but I don’t think it worked! Anyway, the chart remains the same. 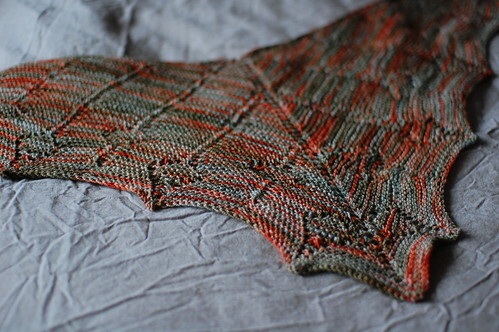 Now some photos of the prototype version that I actually knit first, out of Koigu. I used 2 skeins and had very little leftover. This one is still a bit smaller than the Casbah one because the koigu is thinner. It was a case of me thinking I could remember what I knit after the fact to write the pattern, when I really couldn’t! So I ended up knitting up the Casbah one and writing down the pattern row by row as I went. I really love the Koigu version for the colours and the squishyness (yay garter stitch), but the pattern is somewhat obscured. Laura, is the Milkweed pattern able to be mod’d to make a bigger one? Using worsted weight would be one way, but is the repeat easy to extend to make a version that’s twice as large? I’ve never had a problem with the rav update notifications not working, so if you think it didn’t you may want to check in with Casey. Casey recently posted some details about update links – perhaps this will help? 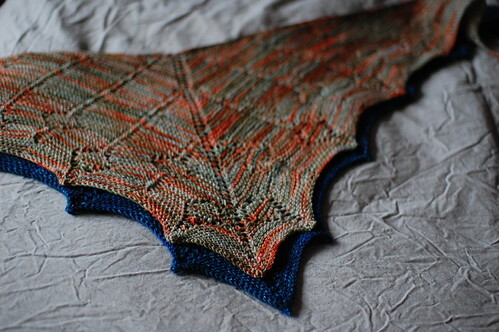 I can’t get the new version to come up, and I didn’t get a Ravelry notice, either. I wonder if it might take awhile for the changes to go through? Either way, I’ve been meaning to start this, so I’m glad for the corrected version! Thanks!